this is not art festival 2006 - token word poetry jam @ festival club, newcastle. 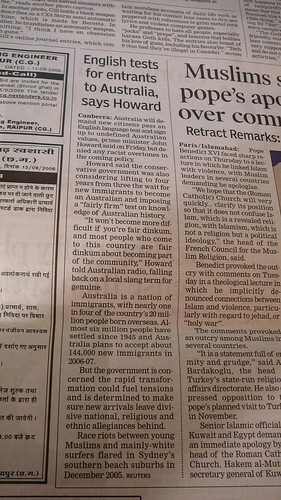 this is an article about Australia's plans to impose English tests on immigrants in Delhi Times - Times International paper, published Saturday 16th september 2006, pg 32.
not many articles make the Delhi papers apart from sports (mostly cricket) and some educational/university related items, so it was interesting & disappointing that this is one of the articles that Australia is linked to. what an impression other countries must think of us! a slideshow video of Battle of the Year Australia 2003 breakdancing finals held in Sydney 09/09/2003 at the State Sports Centre at Homebush Bay. music is "Step Back Child" from five piece funk outfit, CROPPER from the Battle Of The Year BBoy Beats N breaks Annual 2003 CD. http://blip.tv/file/71287 has a video of the Wikid Force breakers performance. the audio is a bit distorted so you might want to turn it down, but it gives you an idea of the energy of their performance - both style and technical moves! http://flickr.com/photos/aliak_com/tags/wikidforce/ has some photos from BOTY2000 in Hannover, Germany. apparently their first album Creativity Department is available nationwide through Obese distribution (in Australia). the audio is a little distorted on the video, the live performance sounded great though!